Markdown is a lightweight markup language. Using markdown, you can write content in a simple and easy to read plain text, and finally, it will generate the equivalent html(valid XHTML or html) for publishing on web. So, it’s certainly more human friendly for web writers, specifically if you are looking for a simple and efficient replacement for WYSIWYG editor. 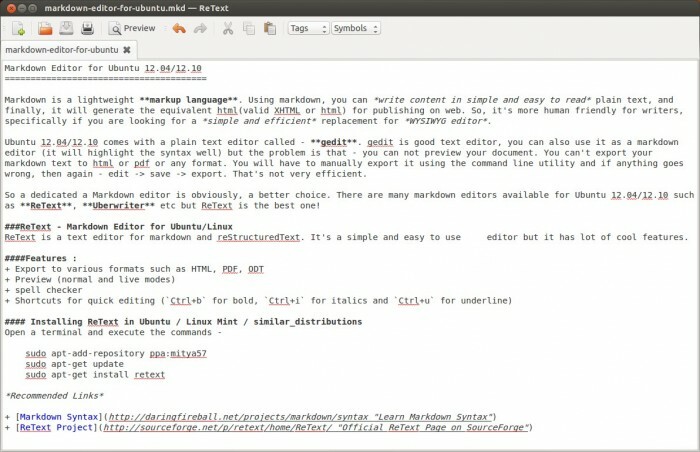 Ubuntu 12.04/12.10 comes with a plain text editor called – gedit. gedit is good text editor, you can also use it as a markdown editor (it will highlight the syntax well) but the problem is that – you can not preview your document. You can’t export your markdown text to html or pdf or any format. You will have to manually export it using the command line utility and if anything goes wrong, then again – edit -> save -> export. That’s not very efficient. 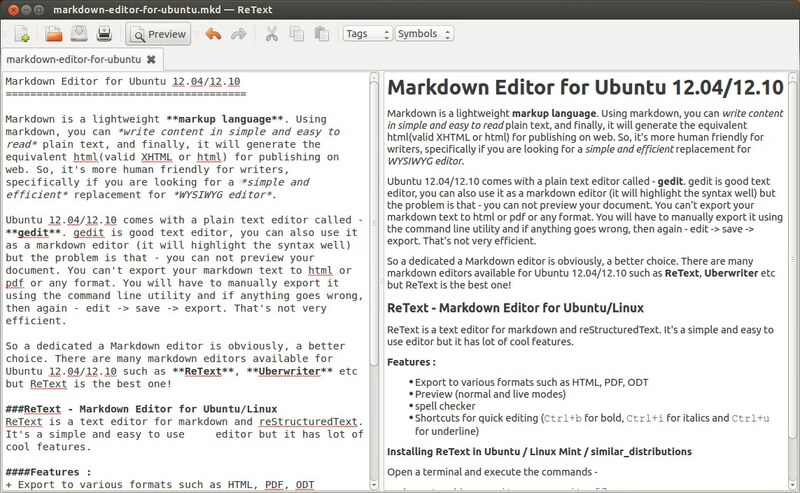 So a dedicated a Markdown editor is obviously, a better choice. 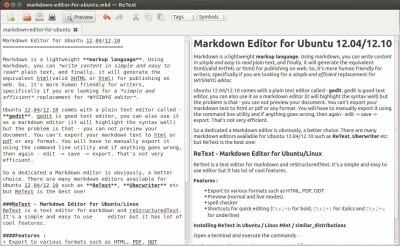 There are many markdown editors available for Ubuntu 12.04/12.10 such as ReText, Uberwriter etc but ReText is the best one! ReText is a text editor for markdown and reStructuredText. It’s a simple and easy to use editor but it has lot of cool features. It’s written in Python, so you can run it everywhere, not just in Ubuntu or Linux Mint (check recommended links section for official page where you can download it for other platforms).